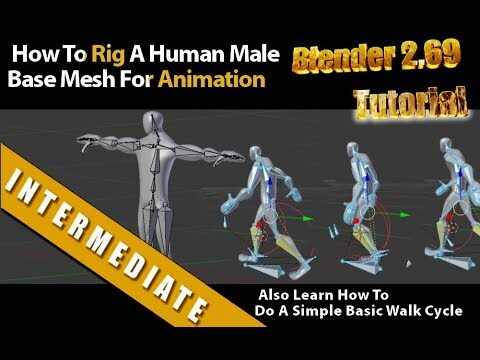 This is article about rigging a human male basemesh with Blender 2.69 for animation. The video is from Alimayo Arango, the explanations are very detailed and you can follow nicely. The author uses the Blender addon Rigify to create an armature for the mesh. After he has connected the model to the mesh he adds a simple walk cycle / animation. The base mesh he uses is the Low Poly Character from Blendswap which you can download for free, it is licensed under CC-BY. The reason why I decided to link to this tutorial is that it is covers many features of Blender for animation and I have the feeling that you will learn a lot while watching and practising. Creating an armature: You can create a human armature with the Rigify addon with one click. Positioning bones: Move the bones in Edit mode to the right position inside of the mesh. Using IK (inverse kinematics): This is when you propagate a kinematic behavior, for example when you grab a foot in Pose mode and the leg is moving accordingly when you move the foot. Using Weight painting: This defines how much the mesh is influenced by the bones movement. Creating animations: He shows us how to use the Timeline for adding animations and keyframes. So get the basemesh and follow the tutorial, it’s a great starting point to become an animator with Blender.